Are your vehicle headlights foggy, yellow, cloudy or appear hazy? Our 5-Step process will restore plastic auto lamp lenses back to their original clarity. Clear headlights give your vehicle a well maintained appearance, improve night-time driving visibility by up to 90%, and increase your vehicle's resale value. 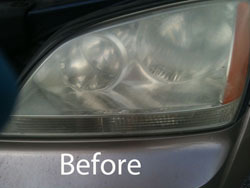 Headlight restoration works great on all cars with polycarbonate plastic headlights. 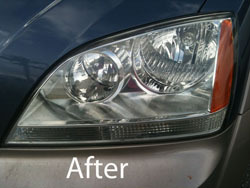 *Ask about our 20% Discount on Headlight Restoration with Purchase of any Exterior or Full Vehicle Detail Service.